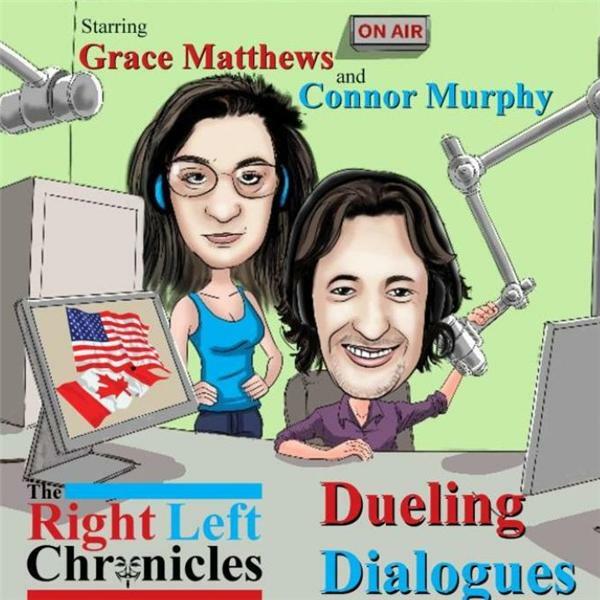 A Dueling Dialogue based on the politically charged emails exchanged between Canadian leftist, Connor Murphy, and United States Midwestern conservative, Grace Matthews. Both are writers at The Right Left Chronicles. Away from the bubble and the beltway, alone, together or with a guest, Murphy and Matthews squabble over current issues and events that impact everyday citizens in the United States, Canada and elsewhere in the World. It’s unobstructed free speech about politics, media, economy, people, social media, and legislation. Eager listeners with a fascination for presidential politics won’t be disappointed as President Donald J. Trump and Prime Minister Justin Trudeau are usually front and center, and rarely far from the topic of the day. 01:15 Asylum Seekers and Refugee Update 01:40 Trudeau Inviting Refugees According to New Democrats 02:00 Safe Third Country Agreement of 2004 05:50 Winter is Coming to Tent City 06:50 On Today's Show - Nuclear Missile Threat From North Korea 07:15 Psychological Profile of Kim Jong Un 14:00 Dangers to Guam 14:55 Canadian Committee Meets On North Korean Crisis 15:30 Canada Opts out of Missile Defense System on West Coast 19:00 The 10,000 km Missile Threat 21:00 Scientific Odds of Nuclear War With North Korea 25:30 Maple Syrop Diplomacy? 26:00 Dennis Rodman As Diplomat?